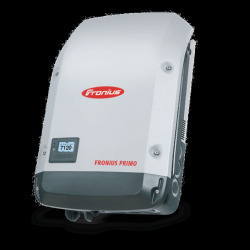 Buy your Fronius inverter directly from our solar shop. Recognized for their quality and performance, the Fronius inverters have included internet supervision. With ALMA SOLAR, you get the best price directly from our solar shop. Add your Fronius inverters and determinate your transport costs directly in your cart. The transport price will be calculated automatically regarding your delivery address. By registering on the FRONIUS site, you will benefit time warranty over 7 years. Don't forget to select as an installer ALMA SOLAR. 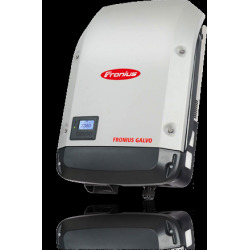 The Fronius company is one of the TOP 3 in solar market for sales solar inverters. Recognized for their quality and performance, Fronius Galvo inverters are the only ones with an inverter transformer. 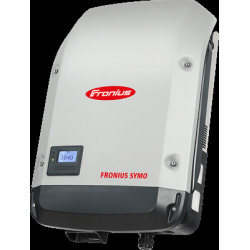 The range of three-phase is named Fronius Symo with a power of 3 to 25kW. The range Symo Fronius answers to all the possibilities of installing solar panels: residential to industrial, Symo Fronius inverter meets your need. Fronius inverters have also and above all an identical MPPT range across all its range. You have no surprises. This technicality, specific to FRONIUS, provides excellent efficiency and performance of its solar inverters. The start voltage range of solar inverters FRONIUS is 120V and produces early in the day and maximize the energy yield of your solar panels. Choose Fronius inverters with ALMA SOLAR is assured the best price with excellent solar performance.